In Heart Of A Dog, artist and musician Laurie Anderson, explores the relationship that she had with her little rat terrier, Lollabelle. In a series of hypnotic, philosophical musings, Anderson looks back on Lollabelle’s life. She considers the impact of her beloved dog's death and the grieving period that followed. Her thoughts move fluidly and, in so doing, consider many themes including life, loss, security and surveillance. However, wherever her reflections take her, Anderson always returns to Lollabellle. Heart Of A Dog has made me consider just what it is I expect from film. All too often, cinema is judged solely on its ability to entertain. Not nearly enough credit is given to those films that make us think. Of course, the worry is that these types of movies will be pretentious. Or ridiculous. Or dull. Thankfully, Heart Of A Dog is none of these things. It is smart, poignant and it will stay with me for a very long time. Anderson narrates her film with a voice that is soft and meditative. It soothes even as it raises powerful, uncomfortable and emotional truths. Meanwhile, we watch a range of images. We see sections of augmented home video, surveillance camera clips and footage of rain falling. At first, I found the combination of narration and imagery somewhat perplexing. 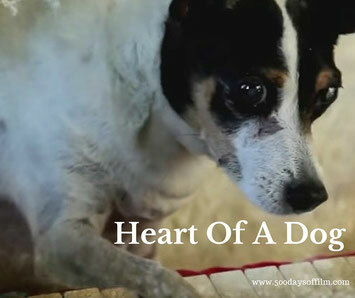 (You can get a sense of the tone and style of Heart Of A Dog by watching the trailer below.) However, once I accepted the film's rhythm, I started to understand Anderson's journey. Laurie Anderson’s love and respect for Lollabelle is clear. Her film will surely strike a chord with any animal owner. However, Anderson is also keen to discuss deeper, more meaningful themes with her audience. Following Lollabelle's death, Anderson explores her grief by reference to the Tibetan Book Of The Dead. This prompts her to consider her own mortality and the other losses that she has experienced - particularly that of her mother. In addition, while Lollabelle is never far from her thoughts, the film’s final song reminds us that Anderson also lost her husband, Lou Reed, in 2013. However, despite these deeply felt losses, Heart Of A Dog is by no means depressing. Indeed, as Anderson looks at the connection between love and death, her film becomes comforting and, ultimately, uplifting. You can find out more about the art of Laurie Anderson by visiting her website: www.laurieanderson.com. Some cinema screenings of Heart Of A Dog allowed dogs to accompany their owners into the cinema. Have you seen Heart Of A Dog? If so, what did you think of this film? Do let me know by leaving me a comment in the box below!